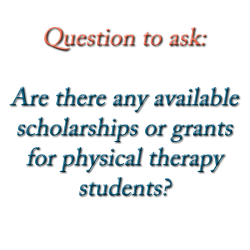 Blog > Which Physical Therapy School Should I Choose? Which Physical Therapy School Should I Choose? Recently, I received an email from a reader of The PT Student. 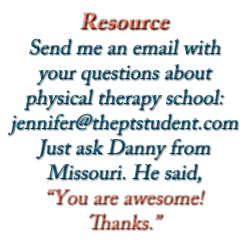 Danny from Missouri asked me if physical therapy school ratings are important when choosing a school. Here, I answer his question, and provide an overview of the most important things to consider when choosing a physical therapy school. Do National PT School Ratings Matter? When I answered Danny’s question, I told him that the national ratings don’t matter much, for a few reasons. Second, the job market for physical therapists (PTs) and PTAs is so good right now, it doesn’t much matter where you went to school, in terms of your employment prospects. In 99.9% of cases, it’s not like law or business school, where someone who graduated from Harvard might get more consideration than someone who went to a lower-tier state school. Lastly, if you take a moment to click on the Methodology link for U.S. News and World Report’s physical therapy schools ranking page, you will find that the data collected is shaky at best. The data are just surveys sent to “deans, other administrators and/or faculty at accredited degree programs.” So, all of the programs were judged by someone at another program, and whoever filled out the survey may or may not have had enough knowledge about that other program. Further, the last time the publication conducted this survey was in 2011. They sent it to 201 physical therapy schools and only received responses from 40% of them. U.S. News and World Report doesn’t disclose the questions on the survey, and clicking on the link doesn’t provide any further information about why that school is rated so highly. There is not enough information provided for a student to make an informed decision. There is a slightly better ranking website called StartClass. This set of rankings does take into account things like the program’s license exam pass rate, average GPA of incoming students, employment rates, graduation rates and student-faculty ratios. Interestingly, this website also takes into account the faculty that have won awards from the American Physical Therapy Association (APTA). However, these awards may or may not translate into a better program from the student’s perspective. Plus, faculty change schools all the time, and all of those statistics change annually, so unless StartClass has a team of people monitoring all 561 physical therapy programs, it is doubtful that these ratings are completely accurate. Plus, StartClass also factors in U.S. News and World Report rankings. And since we have already determined that those are fairly useless, it reduces the helpfulness of these rankings. So, if the national ratings aren’t that helpful for picking a physical therapy school, what can future PTs and PTAs use to help decide where to apply? With the soaring cost of education, the price tag of the program is one of the most important things to consider, because it has such a long term effect on your finances. Unfortunately, not many students take this aspect into account. Student loans, whether they are public (federally insured) or private, will be with you until you pay them off; usually a minimum of $600 a month for 30 years. If you are considering a DPT program at a public institution, your total tuition and fees cost will be $50,294. If you enroll at a private institution, it nearly doubles to $94,251. Remember, going to a DPT program means that you will probably also borrow money for living expenses, because you’ll be in class or studying more than 40 hours a week. So, unless you are able to support yourself with savings, depending on your lifestyle and where you live, you can tack on up to $30,000 a year, or $90,000 to the total. So, that’s about $140,000 for a public DPT education and about $185,000 for private. It would be one thing if paying more for your education guaranteed a better program or a better job when you graduate, but it doesn’t. So, do some research on the cost of your education before choosing where you will apply. Most institutions have this information right on their websites, so it’s easy enough to gather and factor into your decision. You can potentially reduce your costs with scholarships and grants. Ask each potential school what types resources are available. These are the resources that will truly help you financially, because most grants and scholarships don’t have to be paid back. One of the great things about PTA school is that the average cost of a public institution (in-state tuition and fees) is $10,359. That’s for the whole program, and many can be completed part-time, so you can keep working. For some more information on deciding between a PT and a PTA degree, check out this post. For many people, location is the most important factor. You may need to stay in a certain area, because you are planning on living with family, or you have other commitments. In that case, you’re probably more willing to pay a higher tuition amount to stay in your preferred area. For others, a move to a new state is fine or even desired. Just keep in mind that you’ll make the majority of your networking contacts in and around your school, which may help in your job search. You’ll be spending more time then you ever imagined at the school so make sure the commute is convenient. Beyond the commute, there are some other things to think about when it comes to location, such as your internships. Unlike nursing and other similar programs, physical therapy schools generally do not pay clinical instructors to supervise students during internships for 7, 16 or even 24 weeks. These PT and PTA instructors do it for free. Not only do they not receive compensation, having a student means that the clinical instructor can’t get as much work done and makes less money for the facility. Unfortunately, for this reason, many clinical instructors are being told by their administrators that they may not host any more students, due to the financial constraints it puts on the organization. This is a challenge for physical therapy faculty who are in charge of finding enough clinical placements for every student in the program. It’s even harder in places where there are not a lot of placements to choose from, like in rural areas. 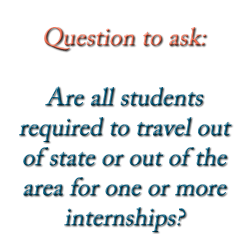 What this means is, if you choose a physical therapy school in a rural area, you can expect to do at least one of your rotations out of the area because there may not be enough internships to go around. Even if you are in a more urban area, if there are a large number of physical therapy programs nearby, all fighting for limited internship slots, there still may not be enough to go around. If you are required by your program (yes, they can require it!) to travel out of state for an internship, you’ll be responsible for paying for your travel and housing during that time. This can be a financial hardship for many students, so it’s best to find this out before you apply, and not after investing two years in a program. As mentioned above, all physical therapy programs are required to essentially teach the same content. So, if they all teach the same thing, the real difference between programs is in the teaching philosophies and methods. For example, my program (University of Maryland, Baltimore) had a traditional lecture/lab structure. But, at Sacred Heart University, they use problem-based learning, where students are assigned a case, come up with a plan for what they need to research, and report back to the group and teach each other. More and more programs are harnessing technology and offering “flipped classrooms” where you watch a lecture video on your own, and use in-class time to discuss, question and practice. This is another area to research about potential programs. Some students are most comfortable with the traditional lecture format. Some students find lecture to be a snooze-fest, and would rather teach themselves in a self-directed learning format. Make sure you are comfortable with what your potential program offers before applying so you don’t wind up in a curriculum that makes learning physical therapy any harder than it already is. CAPTE tells all physical therapy programs that they must make student outcomes available to everyone. This means that any prospective student who asks is entitled to the program’s graduation rates, employment rates and pass rates on licensing examinations. Since most programs are required to provide this information, it can usually be found on a website. Make sure you look into this information. If 40% of the program’s students fail out or otherwise leave, that is a sign that the program is either very tough, has crappy faculty, or something else is wrong with it. Look for a graduation rate of at least 75-85%. That’s about the national average for DPT programs. For PTA programs, the national average is about 70%. The three year ultimate pass rate on the National Physical Therapy Examination (NPTE) is also a good measure. The national average for the PT version of the exam is 88-90% passing on the first try, with 99% eventually passing it on a subsequent try. For PTA schools, the national average is about 81-84% on the first try, and 94-95% eventually passing on a subsequent try. If the school you are considering is well below the national average, it could be that the faculty are just not that great. Or, it could be that the application pool is small and the school is admitting students that are not as strong academically. Or, that the faculty are allowing students to pass through the program when they really haven’t demonstrated the appropriate levels of knowledge. Whatever the reason, you might want to avoid a program with dismal NPTE pass rates. If the employment rates are low, that’s a red flag too. The unemployment rate for physical therapy is so low right now, that there is virtually no reason for a large number of graduates to be without a position. If you’re seeing employment rates below 98%, something is wrong. It’s either a rural area, with not many jobs to begin with, or the graduates of that program have a bad reputation. Here are a few resources that will help you to collect more information about potential programs. Good luck and leave a comment if you have any other helpful pointers. CAPTE’s website has a lot of resources, including a list of accredited programs. APTA also has a prospective students section. Thank you so much of giving me this information. It is quite helpful. Thank you for spending time on it.!! Thanks for the great information and in-depth answer. Great article. Hello, new reader here, I have some questions for the group. I want to explore the PT Assistant field. I have finished my Associates Degree in Science, and am volunteering at a hospital with a part time job at a retirement home. I am looking into PT Assistant training programs. I would like to do a part time PTA program. I do better with the science courses if I can focus on one or two at a time. But my local community college has only a full time PTA program. I also like online courses. I see some schools with online courses, but I don’t see any that have a complete program. I read in a blog that most PTA students do their training part time after they finish their general education courses but I am not sure if I am seeing a good part time program. What did people in this blog do? Did you do PTA training part time, and if so where? Did you get an internship or job at a PT office first, and then do training after? I appreciate insights people have, thanks. 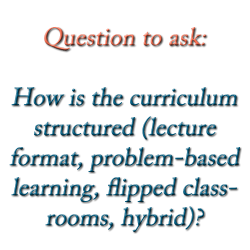 The problem based learning curriculum can make a huge difference. Clarkson University is another school that using the pure PBL program and definitely worth a look. Hey Greg! Do you have personal experience with PBL? If so, I would like to ask you a few questions! I am a international student from Honduras going into my senior year of pre-physical therapy. I only came to the US for college so I do not know many places nor do I have close family here. I also don’t have a car. I have been trying to decide what DPT schools to apply to, but I have no idea where to start since I haven’t been many places in the states and I don’t have anything tying me down to a specific place. I do not know if you can relate at all or have any advice for me, but anything would be appreciated! I like that you said that it’s important to consider the number of hours that a physical therapy will require you when you’re commuting. My son is planning to find a therapy school. He said that he’d like to have more time to relax at home after his school, so he won’t end up feeling too tired on a daily basis. Thanks for sharing this.